Children on the autism spectrum are more likely than their ‘neurotypical’ peers to experience anxiety, and when you consider all of the things a child with ASD copes with on a daily basis – communication challenges, sensory processing sensitivities, an inability to express their own emotions and understand the emotions of others, difficulty with transitions, poor impulse control, and problems with self-regulation – it’s hardly surprising that autism and school anxiety tend to go hand in hand. Of course, it can be difficult to distinguish if the behaviors and reactions a child is exhibiting in the classroom are a result of their autism diagnosis, anxiety, or a combination of the two, but for the purposes of this post, we’ll focus on autism and school anxiety: what it looks like and how to help. We’ve all experienced anxiety at some point in our lives – on the first day of school, during a job interview, when we’re getting ready for a first date, while giving an important presentation at work – and most of the time, these feelings are completely normal. Sometimes they’re even helpful as they ensure we prepare for important events in our life, and keep us safe in dangerous situations. But when anxiety lasts longer than it should and/or begins interfering with our daily functioning, an anxiety disorder could be to blame, and individuals with autism tend to struggle with anxious feelings more than others. While a large percentage of children with autism attend mainstream schools, research shows that most teachers are ill-equipped to deal with the additional challenges students with ASD face. They lack access to appropriate training and often don’t have enough hands-on help within the classroom to dedicate enough one-on-one support to the children who are struggling most, and since no two individuals on the autism spectrum are the same, the strategies that work for one child may not work for another. It can feel like a constant guessing game, particularly at the beginning of the year as teachers try to get to know their students, and with some classrooms catering to over 30 children at a time, it can be difficult to keep up. Educate yourself. With 1 in 68 children being diagnosed with autism each day (source), it goes without saying that teachers need to take the time to educate themselves about autism. The more they understand the struggles a child on the spectrum faces, the easier it will be to strategize ways to help the students in their classroom cope. Setting up a meeting with the parents/caregivers of ASD students to discuss the specific challenges a child faces, what has/hasn’t worked in the past, specific goals that have been set for the child, and any other important pieces of information that can help set the child up for success at school will make working with autistic children much easier. Remember that no two individuals with autism are the same, so the more you know about a child’s specific diagnosis, the better. Educate your students. One of the biggest challenges kids with autism face is socialization, and the inability to communicate with and understand the needs of others can exasperate challenges with autism and school anxiety. Taking the time to educate students about autism will foster feelings of empathy, leading to a more inclusive classroom. CLICK HERE for some of our tips and ideas for explaining autism to ‘neurotypical’ kids. Use visual schedules. Providing a child with a visual representation of what her day will look like ahead of time will help lessen feelings of anxiety while also empowering her to look to the visual schedule and move from one activity to the next without prompting, which lessens the chance she will be caught off guard and react poorly. The Easy Daisies Grade 1-7 Classroom Schedule is one of my favorite classroom tools, and it can be adapted for use in the home! Make transitions easier. Children with developmental delays like autism can find it particularly difficult to move from one activity to another. They may become visibly agitated and overwhelmed, express feelings of sadness and anger, and some may erupt into a full-blown meltdown, especially when they are expected to transition from an activity they enjoy to something less desirable. These reactions are often difficult to control, and can lead to low self-confidence and social anxiety over time. Providing warnings, using a timer (I love the Time Timer as it helps kids understand the passage of time visually), and teaching calming strategies can all help make transitions easier for kids on the autism spectrum. CLICK HERE for more of our tips for making classroom transitions easier. Schedule sensory breaks. Also know as ‘brain breaks’, sensory breaks are designed to provide the sensory input a child needs to stay alert and focused and in control of her emotions, and while these breaks are especially important for children who struggle with challenges like ADD, ADHD, sensory processing disorder, and autism, regular movement breaks can benefit all children. By giving their brains a rest and allowing them to engage in a few minutes of physical activity to get their wiggles out, teachers may notice improved attention and focus, increased retention of material being taught, improved emotional regulation, reduced behavioral problems, improved gross motor skills, increased motivation, increased inclusion and cooperation, etc. CLICK HERE for some of our favorite sensory breaks for kids! Determine what’s causing the anxiety. While autism and school anxiety isn’t uncommon and is often a result of multiple factors, sometimes a specific part of the school day is to blame. Talk to your child to see if one or more activities cause her anxiety to heighten. For example, your child may struggle when the classroom becomes too loud, while transitioning from one activity to another, or while trying to complete fine motor tasks. Each of these can be approached using different tools and strategies (noise cancelling headphones, a timer, and additional fine motor practice), and while it can be difficult to pinpoint every single thing that causes kids to feel anxious, the more you know, the better you’ll be able to help your child. Practice. You’ve probably heard the saying, ‘practice makes perfect’, and while I’m not a fan of encouraging perfectionism in any way, shape, or form, I do believe that the more we practice something that causes us stress or anxiety, the more successful we’ll be. If autism and school anxiety is a struggle for your little one, consider setting up a pretend ‘school’ at home so you can run through what the day looks like and focus on certain parts of the day your child finds challenging, and take the time to practice getting ready for and traveling to school in the mornings leading up to a new school year to ward off separation anxiety. Spend time in the classroom together. Another great idea to help a child with autism and school anxiety is to spend time in the classroom together. Talk to your child’s teacher to see if you can organize this before/after the school day when there are fewer children present and the environment is less overwhelming, and help your child explore everything the classroom has to offer. Show her the different materials available to her and choose a few calming activities she can do throughout the school day when she feels overwhelmed. Use calming tools. There are tons of great calming tools to help with both autism and school anxiety. Fidget toys, squeeze balls, and chewing gum are all great classroom-appropriate ideas that can help reduce feelings of anxiety and restore a sense of calm. Mindful breathing is another great coping mechanism to teach to kids with anxiety. CLICK HERE for some of our favorite breathing techniques! Use visual schedules. As mentioned above, visual schedules can work wonders in helping kids with autism and school anxiety. Providing a child with a visual representation of what her day will look like ahead of time will help her feel more prepared, and also empower her by allowing her to look to the visual schedule and move from one activity to the next without prompting. The more prepared a child is, the less likely she’ll be caught off guard and react poorly in the face of transitions. The Easy Daisies Grade 1-7 Classroom Schedule is one of my favorite classroom tools, and it can be adapted for use in the home! Use social stories. Created by Carol Gray, Social Stories are written descriptions of everyday situations and events told from a child’s perspective. The intention behind Social Stories is to give a child something to rehearse so that she’s prepared once the situation described actually takes place. This can be an excellent strategy to help a child with autism and school anxiety, and we’ve put together a guide to help you create individualized social stories for your child HERE. Be prepared. Mornings can be hectic at the best of times, and when you add a child with autism and school anxiety into the mix, it can be downright overwhelming. Unfortunately, very few of us understand the domino effect our actions and reactions can have on our children. When we’re rushed and short-tempered, we fail to give our kids our undivided attention at a time they so desperately need it. A much better strategy is to prepare the night before, set our alarm clocks 30+ minutes earlier each morning, and do our best not to book appointments and meetings until at least an hour after school drop-off so we can focus on what really matters: our children. Don’t be afraid to make special accommodations. As much as parents want their children to integrate within their school environment, sometimes special accommodations need to be made. If autism and school anxiety are a constant struggle for your little one, work with her teachers to find ways you can make anxiety-provoking situations more manageable. If school drop-off is a challenge, ask if your child can spend the first 15+ minutes of her day coloring or reading in a quiet room before joining the class. If recess is too overwhelming, ask if she can spend that time in the library or helping out in the administrative office. If fine motor skills are an issue, make arrangements for your child to use a (refurbished) iPad over writing. If gym class is too loud, equip her with a pair of noise cancelling headphones. With a little creativity, the possibilities really are endless! I love both of these quotes because they serve as an important reminder to the parents – and the teachers – of kids with autism and school anxiety to keep fighting for the exceptional children in their lives. Instead of looking for a cure, sometimes we need to focus on finding ways to make life more manageable for the kids that need us most. This means finding acceptance within ourselves, fostering it in others, and empowering the kids who struggle with appropriate coping skills and strategies to make their world a little less scary. Remember to think outside the box, to practice often, and to never (ever) give up. 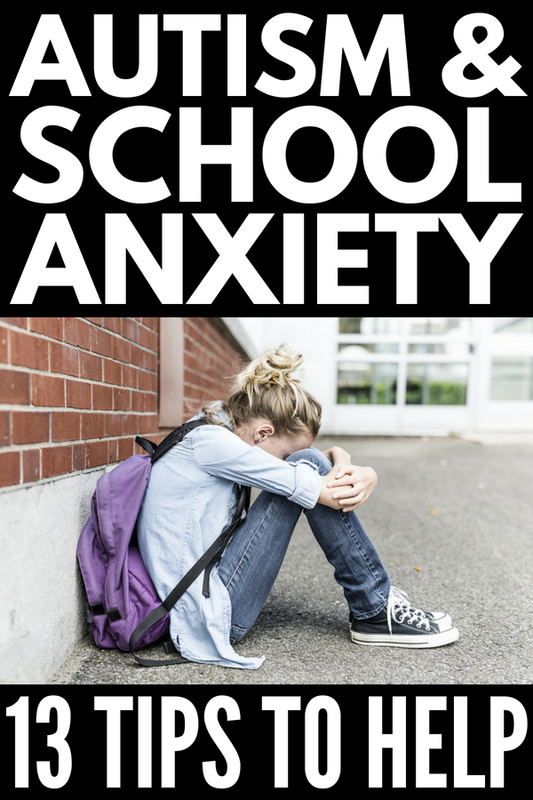 If you found this collection of tips and strategies to help kids with autism and school anxiety helpful, please share this post on Pinterest! And if you’re looking for more autism-related tips and tricks, please follow our Autism and Sensory Processing Disorder board, where we share all kinds of fabulous tips and tricks we find each day!